Observing these counterintuitive happenings in larger objects has always been difficult, but University of Queensland physicists – part of an Austrian/UK research team – have created a new technique to make the observation of quantum movement much easier. The discovery could aid the take-up of quantum physics in new technologies – such as ultra-sensitive motion sensors similar to those in mobile phones – which harness quantum motion's unusual properties. Dr Farid Shahandeh, who did his PhD at UQ and is now at Swansea University, said the new technique had similarities to "listening" to a violin by looking at its strings. "When a musician plays a violin, each string vibrates at a specific frequency to create a specific sound and the combination or 'superposition' of all those frequencies creates the music you hear," he said. "If you cannot hear the music, just like Beethoven in the last decade of his life, it is extremely difficult to grasp what is being played only by watching the bow's strokes. "In quantum physics, we are deaf to the sound of quantum 'violins' but our new technique uses light to make it possible hear them." Researchers have made significant progress in playing quantum instruments but hearing their sound and making sure that it is a melody – not just a single frequency – is notoriously difficult. Dr Martin Ringbauer, a collaborator in the Australian Research Council Centre for Engineered Quantum Systems (EQUS) at UQ, said the team's new approach was akin to taking snapshots of a violin's moving strings. "Other methods try to extract the whole quantum motion at once, but our approach is to reconstruct it from a series of snapshots taken with a strong beam of light," said Dr Ringbauer, who is an UQ honorary research associate, and is currently working at the University of Innsbruck. "The quantum violin still produces sound in the sense of vibration, although this would be too high-pitched to be audible. "The important thing to understand is that you cannot play this violin using a normal bow: you have to use light to make the strings vibrate. Dr Ringbauer said the flexible new technique made it possible to observe quantum motion in many current experiments where other methods failed. 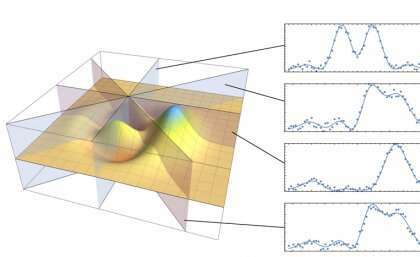 "The ability to observe and verify the quantum properties of mechanical systems is a vital step in the development of new quantum technologies," he said. The researchers published their discovery a paper titled "Optomechanical state reconstruction and nonclassicality verification beyond the resolved-sideband regime," in Quantum.